Monday, August 8th, 2016 we used up all the resources generated by Earth in a year. Humanity’s annual demand for what nature can generate for our existence has been exceeded. Out of what Earth generates, according to the “World Resources Institute (WRI), roughly one-third of all food produced worldwide, worth around US$1 trillion, gets lost or wasted in food production and consumption systems.” Reliance on a linear model of production has resulted in an estimated$70 billion worth of rare earth minerals in landfill from discarded electronics. In the U.S. 58% of energy produced is wasted. Concurrently, as if hypnotized, companies strive to make quarterly revenue targets wasting even more energy: Nature’s and human potential. Expanding leadership consciousness to create workplaces where people can contribute full throttle is the highest leverage for business to do better for society, the economy and for all of life. Business leadership and commitment could do much to create prosperity and abundance. In ‘Seizing the Executive Imperative to Expand Consciousness’ I described the leadership consciousness gap as a chasm between an old view of the world, where linear and analytical thinking worked to make sense, and today’s reality, where business faces bigger, more complex issues. Decisions are still being made using habits and beliefs that resist innovation and constricted by fear. Yet in forward thinking companies of all ages, a higher order of thinking and caring is being activated. Humungous planetary and social issues are propelling business smack into a collision course where seeing systems is a requirement, not optional. What skills do leaders at every level need to redefine company value and contribution as a measure of its capacity to sustain life on the planet as a whole? 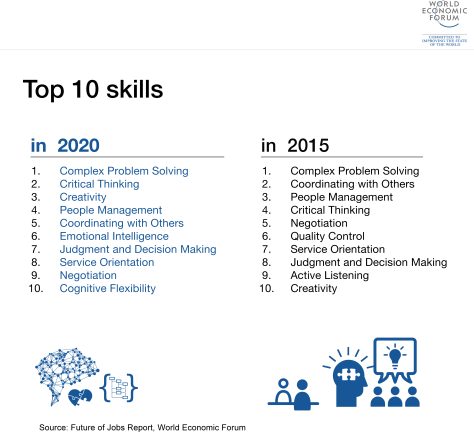 At the World Economic Forum in Davos 2015 the top ten innovation skills were contrasted with what will be needed for 2020. Not surprisingly, it looks like a conventional HR list because it came from surveying Chief HR and Strategy Leaders from top employing companies. It is also what you would expect to see from a conventional view of business. However, reality is changing fast. Conventional companies are failing faster, losing out to exponential companies: companies that have a small number of fully engaged people collectively creating high value and fast. The worldview of how to conduct business that makes a positive contribution to societal and planetary well-being is transforming. Are the top 10 skills reported in the Future of Jobs report by the World Economic Forum sufficient to surf the big waves of exponential change? Will leaders be able to handle disruption from innovation, economy shifts, and ecological surprises? The 2020 Innovation Skills tinker with, rather than transform, decision-making/leadership consciousness. Deeper intrinsic skills are needed to provide the depth to wisely handle big complex planetary issues and capacity to initiate or foresee exponential innovation of the kind cultivated by Peter Diamandis and the XPrize Foundation. A preliminary short list of the transformational skills (meta and micro) to expand from one level of consciousness to another is much longer than is practical here. Instead, here are the macro-meta skills that, through mastery, enable you to self-coach and lead yourself to higher levels. Think of yourself as an App called Human Consciousness 7.0. Focus: What is the underlying motivation behind decisions and communication? Saving reputation and status? Achieving a 10X goal? When and how often do you switch off focus so you can hear your inner guidance and intuition? Can you detect the effect that focus on profit is having on the performance energy across the organization? Are goals worded keeping in mind brain science so the focus is on appreciation and not on finding more problems to solve? Do you step back and switch from analytical thinking to seeing the social-emotional system running performance and achievement?Informs judgment and decision-making. Service orientation at scale. Sensing: Can you detect the deep dynamics and interactions between the formal structures of power and the informal working relationships and social interactions that get things done? How would you rate your capacity (and company-wide practice) to reflect and learn? Can you, as an executive, sense the state of well-being in yourself or in your company’s workplace? (Note: If you have stress-related illness or disengagement the answer is you can’t.) Can you see patterns? Can you observe where attention is going (energy flows where attention goes)? Can you sense the emotional currents inside the company in relation to customer values and focus? Can you see anomalies in patterns (insights)? Informs when to problem solve; when to apply creativity to complex problems. Helps you see the system. Tap into social-emotional timing. Trust: Are you comfortable enough with uncertainty that you prefer to use it to challenge your growth, keep your edge? Do you know how to create psychological safety in the workplace? Does your relationship with your personal power make the need to control others un-necessary? Have you or do you use life’s interruptions to expand your capacity to lead yourself? To grow? Is conflict used to separate and increase division or considered part of divergent thinking, seeing, feeling? Do you trust in your abilities to handle the unexpected, and seek out change and uncertainty as a way to achieve your potential? How comfortable are you with transparency? How strong is the sense of care and belonging in your company?Informs how to support performance and remove barriers. Empathy: Are you aware of bias as an unconscious element in your decision making? Do you design decisions to remove bias? Can you sense the emotional wellness of teams, the company or someone with whom have had differences of opinion? Is your first reaction to judge or to follow inquiry to surface underlying secrets? To what extent do you collaborate over control? Can you sense the future and do you ensure diversity of perspective is naturally integrated? Are you or is your company afraid of emotions or the word ‘intuition’? Are you making a difference to society or to the natural systems supporting life? Informs well-being, timing, mitigates harmful impact of decisions, timing and process for change, how relevant company is to customers, when to pivot or reinvent. Mindfulness: How aware are you of your perception, of how you see, interpret and make sense of information or events? Can you hear self-regulate, accept and receive divergent views without activating a need to be right or to control? How well do you manage your own responses to trigger words, people or events? Can you step into the space between action and reaction and pause a milli-second to select on a different response? Are you happy? Do you love your life? Do you add value to others’ lives? Do you make a difference to someone? Creates happiness, well-being, much better decisions under pressure, cognitive flexibility, mental and social health. Heart-based connection. Raising your level of consciousness is not a linear experience. Every new context demands choice to personally or organizationally expand. Each event triggers growth and expansion or contraction and fear. Your perception shapes your thinking and can release available energy or deny potential and close the door. Is organizational life made of persistent problem solving? Or is it focused on expanding appreciation? Are big challenges being used to inspire engagement or work harder repeating past practices? In every person and company, there is a well of untapped innate intelligence that, when awareness and action are applied, can tackle any challenge, large or small, personal, professional, societal or global. Transforming traditional workplaces into great ones that support innovation means changing how you see and interact with the world as it emerges. Commitment to embodying Human Consciousness 7.0 is the highest leverage for successfully adapting. As the mystics wisely stated: We’re the ones we’ve been waiting for. The solutions definitely lie within.